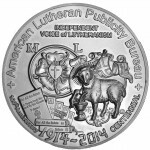 These medals were published by the American Lutheran Publicity Bureau in the years leading up to the 2017 observance. They were designed by the Rev. 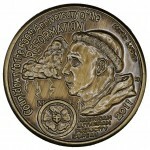 Scott Blazek and engraved by Kevin Douglas. 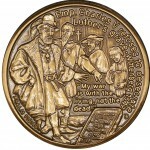 All the medals were struck at the New Orleans Mint in New Orleans, LA. 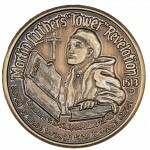 Number of medals issued in each series metal type: in bronze – 150 medals; silver 100; and aluminum 7,000. All metal types 1 1/2 inches. 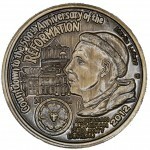 Obverse: Countdown to the 500th Anniversary of the Reformation 2011. 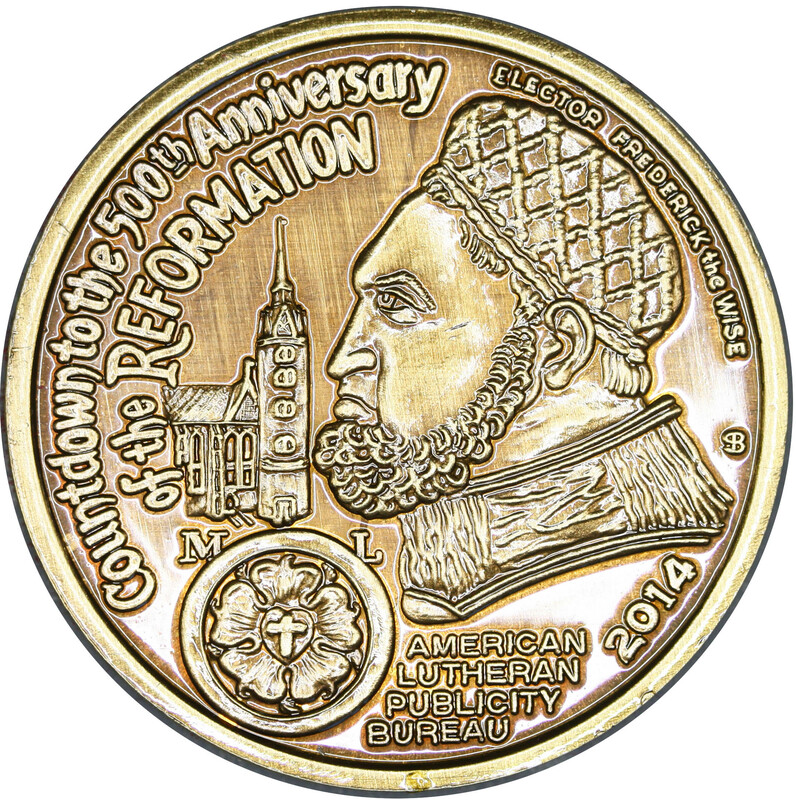 Luther portrait after Lucas Cranach the Elder. Luther looking at a lightning storm. Design by Scott Blazek. 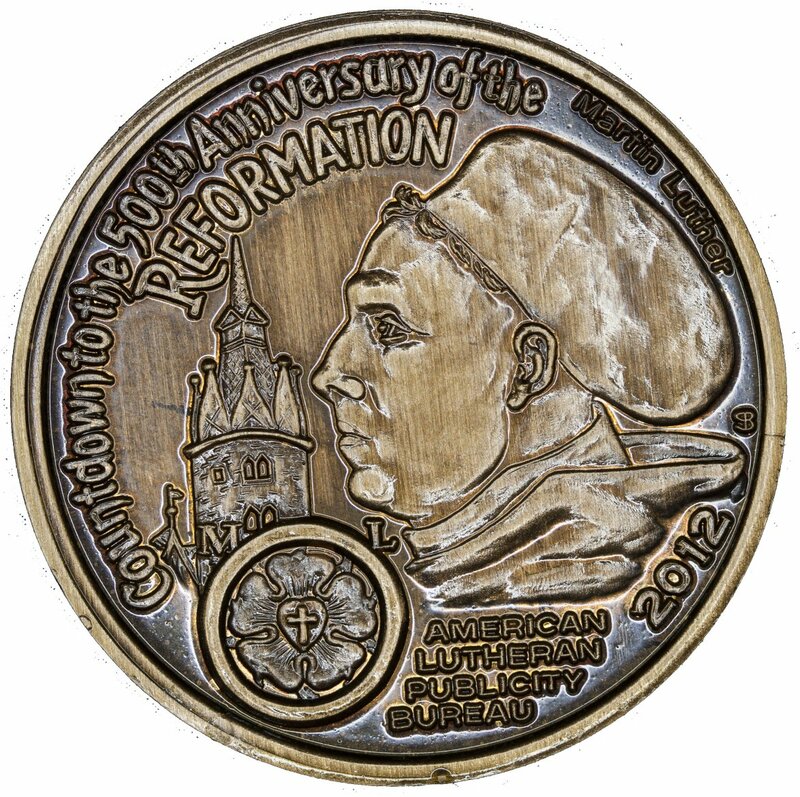 Reverse: Luther in a lightning storm (1505). 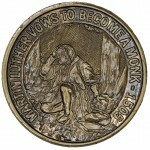 Martin Luther Vows to Become a Monk. 30.08 gr; 39.1 mm. Brozatus #257. 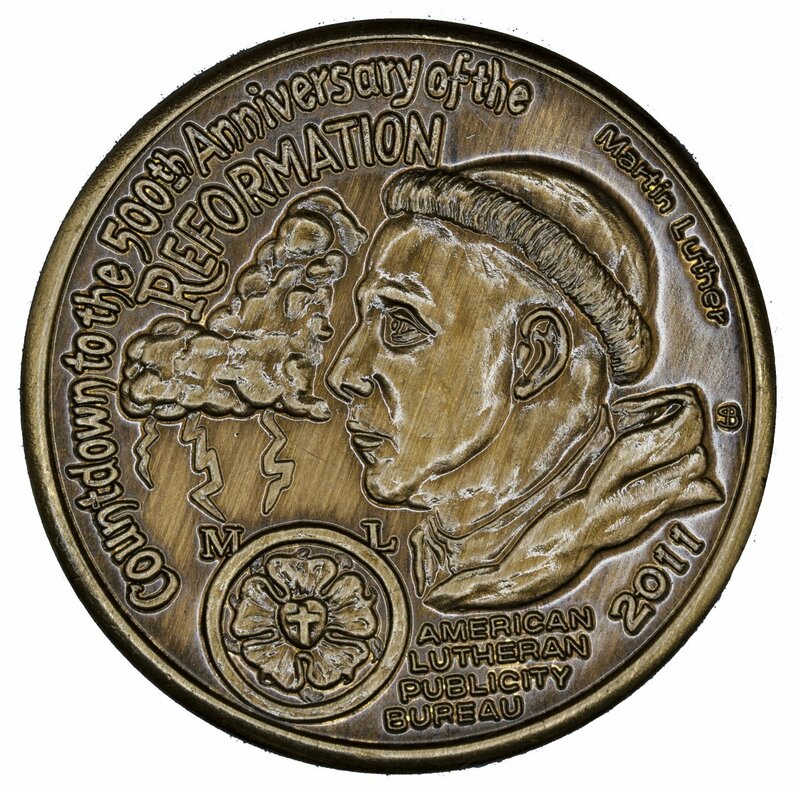 Obverse: Countdown to the 500th Anniversary of the Reformation 2011.. Luther looking at the entrance to the Erfurt Monastery. 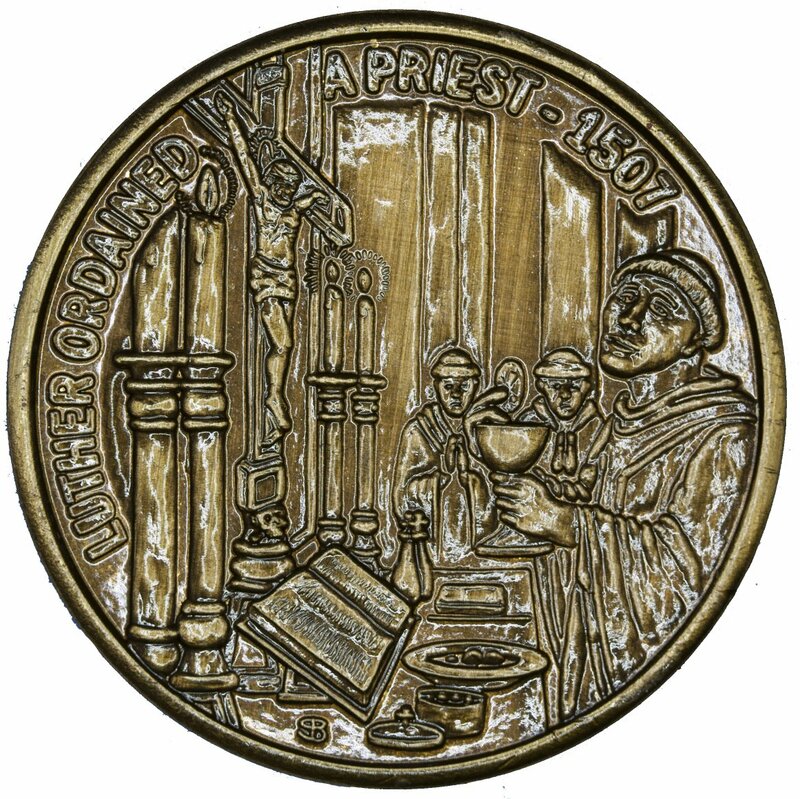 Reverse: Luther ordained a priest (1507). 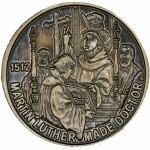 Luther has a chalice in his hand and looks toward a crucifix. In background two monks.Designed by Scott Blazek. 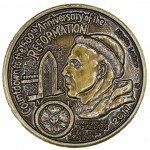 30.02 gr; 39.1mm. Brozatus #258. 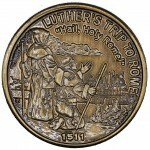 Reverse: “Hail, Holy Rome.” Luther travels to Rome (1511). 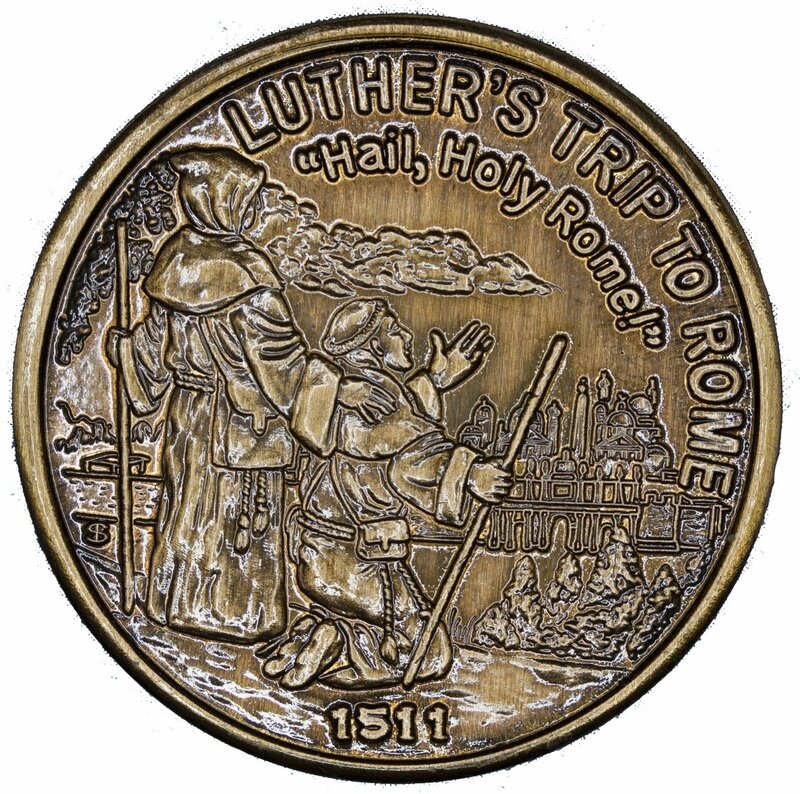 Luther has walking stick in right hand and kneels before silhouette of Rome. His traveling companion stands behind him. 31.12 gr; 39.5 mm. Brozatus #259. 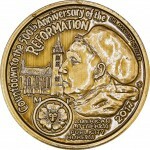 Countdown to the 500th Anniversary of the Reformation 2012. 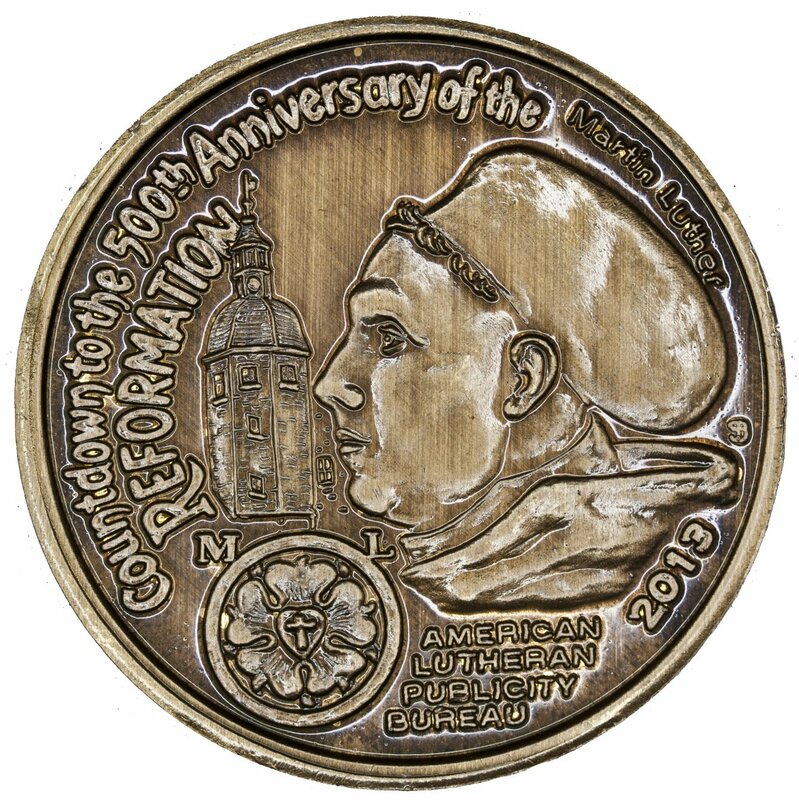 Luther looks toward the Castle Church where he became a Doctor of the Church.The Luther rose is under the image of the castle church. 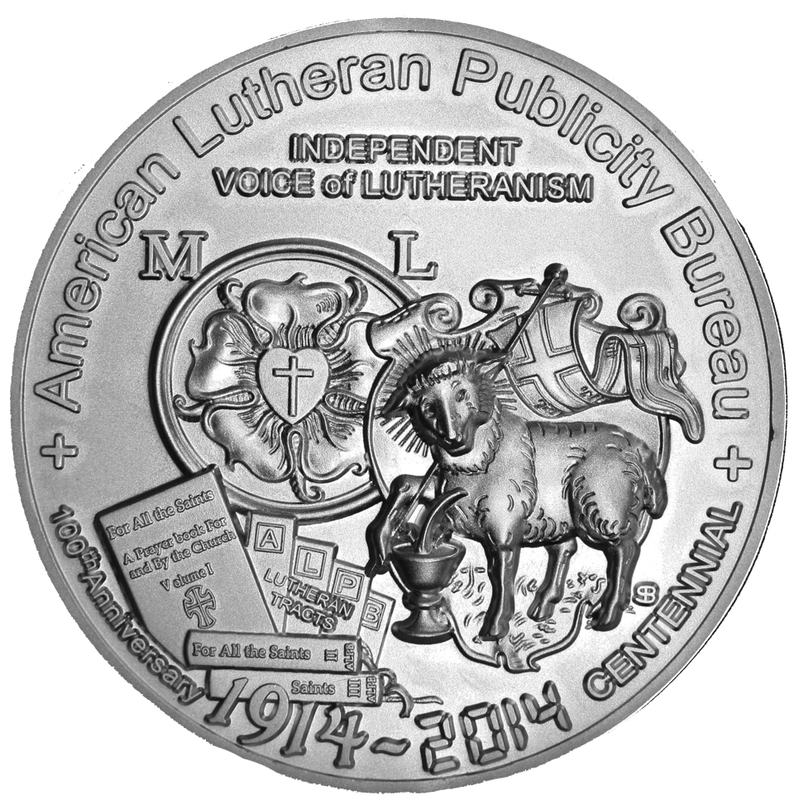 American Lutheran Publicity Bureau. Designedby Scott Blazek. 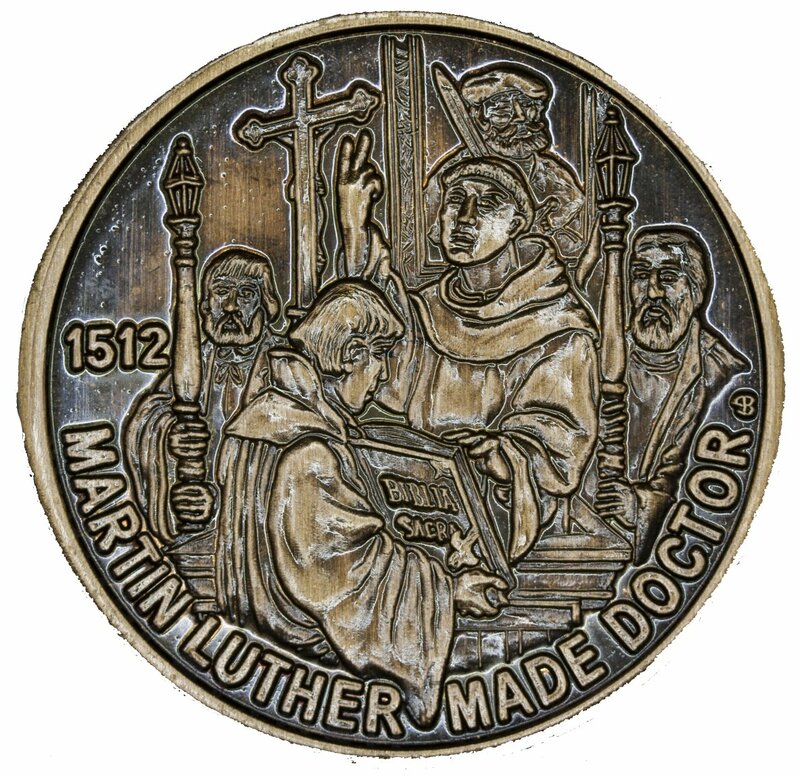 Reverse: Martin Luther made doctor. 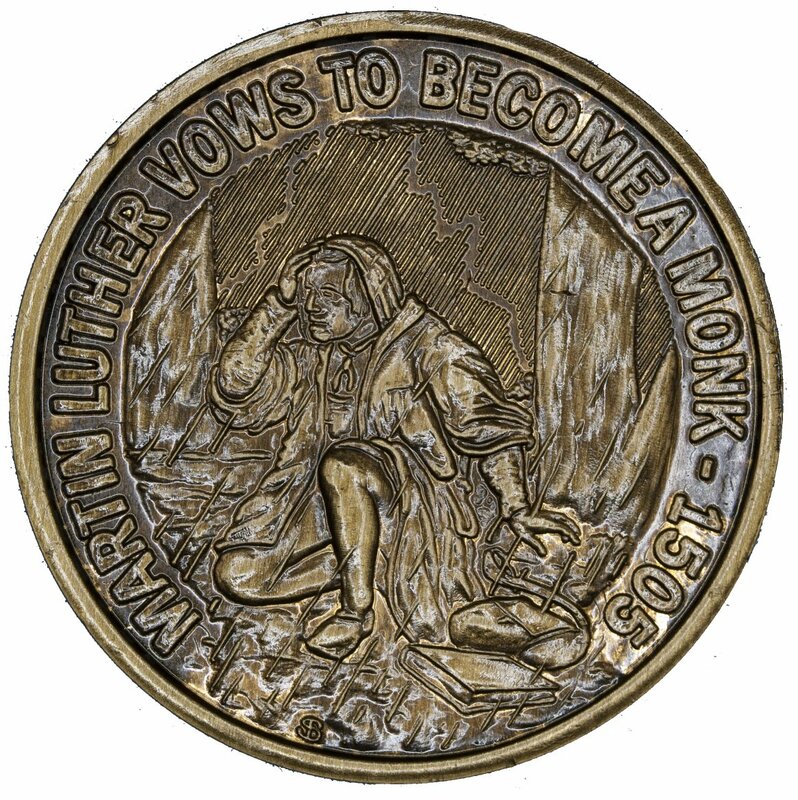 Luther’s hand raised for taking an oath. Biblia sacra. In background a picture of Frederick the Wise. 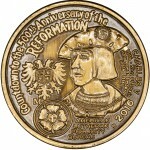 1512. 31.14 gr; 39.5 mm.Brozatus #260. 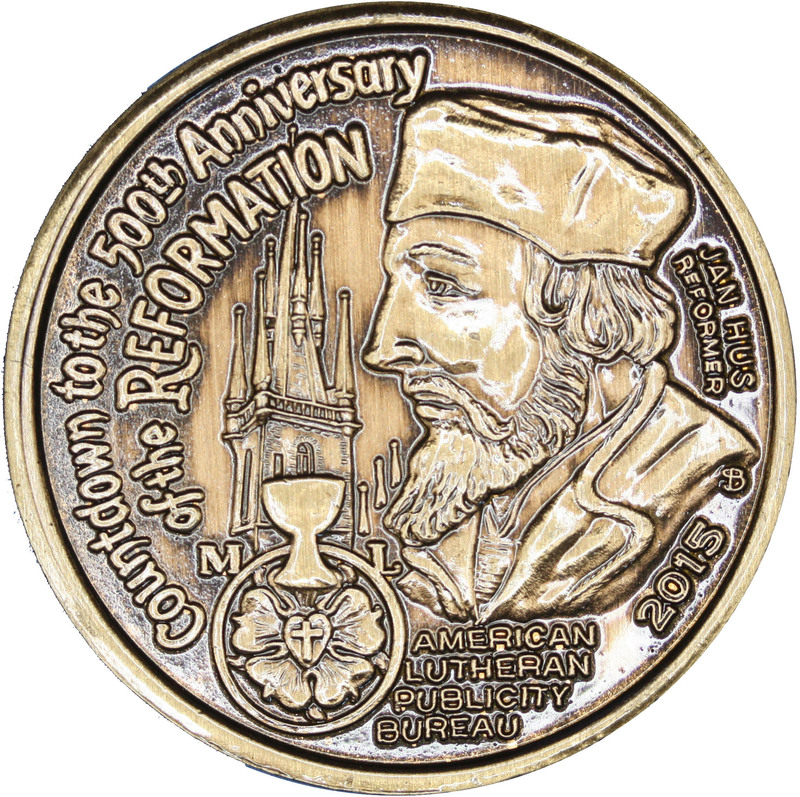 Obverse: Countdown to the 500th Anniversary of the Reformation. 2013. 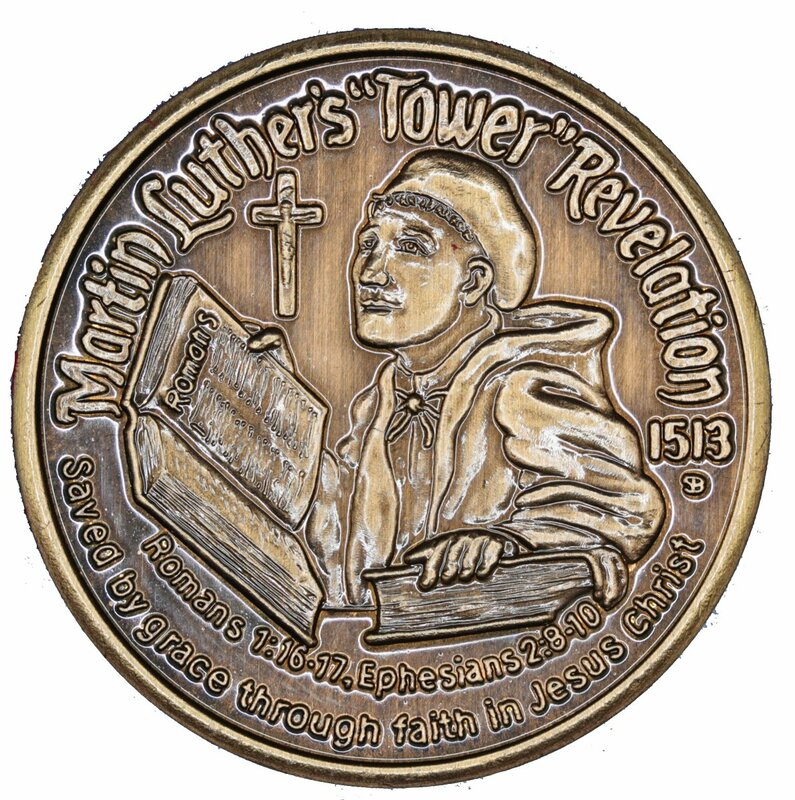 Reverse: Luther’s “Tower Revelation” (1513). Romans 1:16-17; Ephesians 2:18-20. Saved by grace through faith in Jesus Christ. 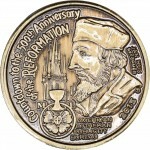 1513. Brozatus #261. Series #6. 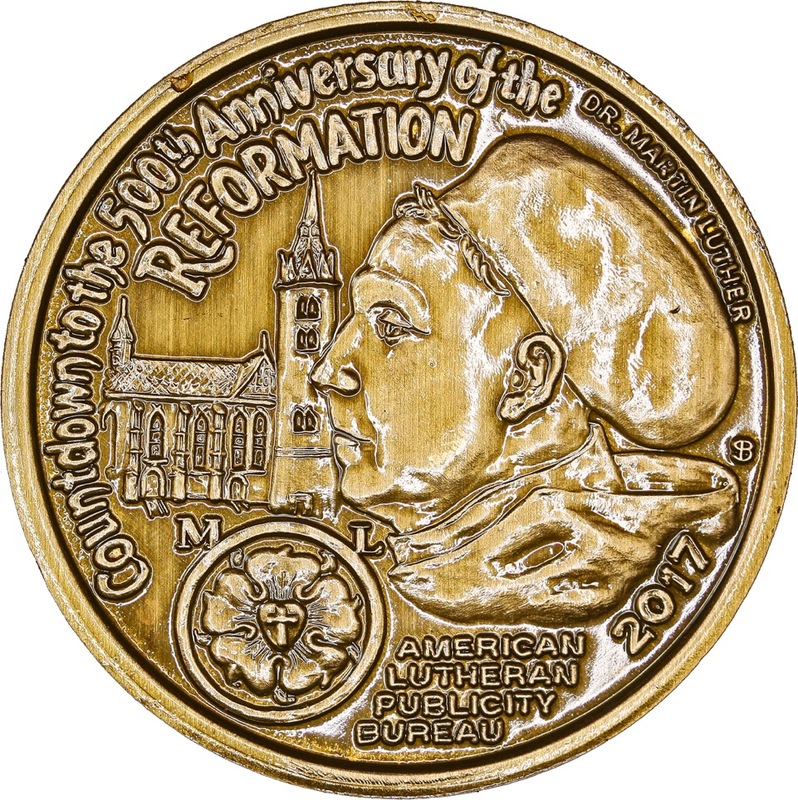 Issued in 2014. 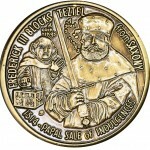 Frederick III of Saxony founded the University of Wittenberg in 1502. 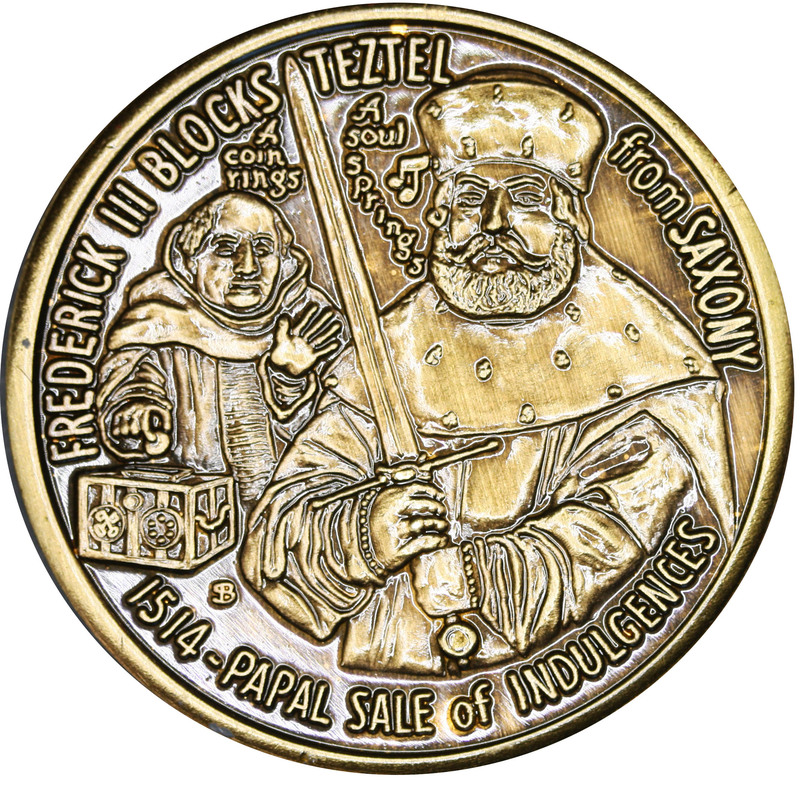 When John Tetzel came selling indulgences for Rome, Frederick blocked his coming into his territory. 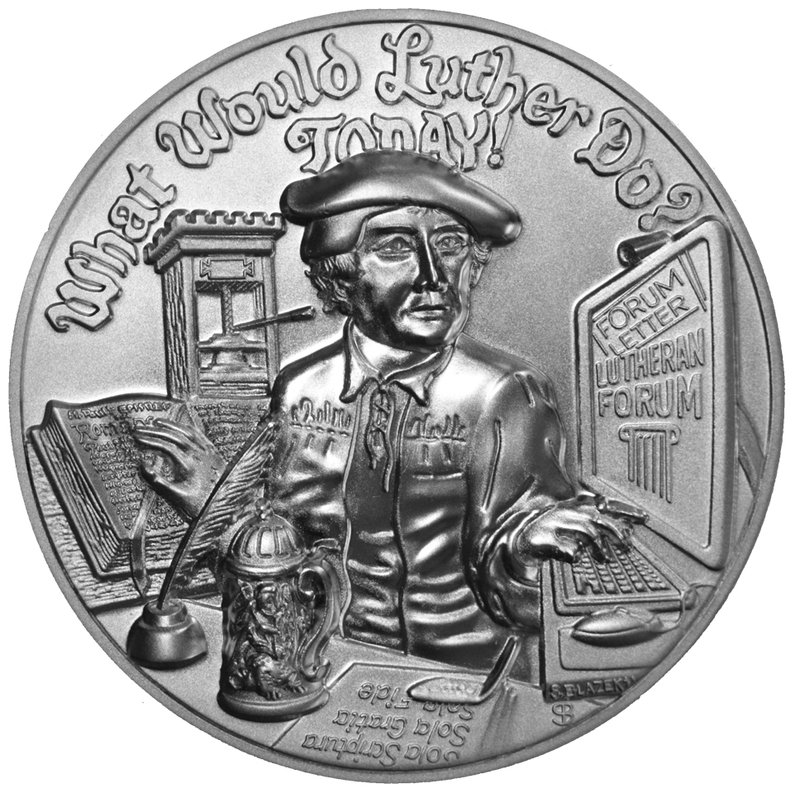 He gave Luther sanctuary in Wartburg Castle where he translated the New Testament. Not in Brozatus. Series #7. 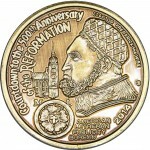 Issued in 2015. 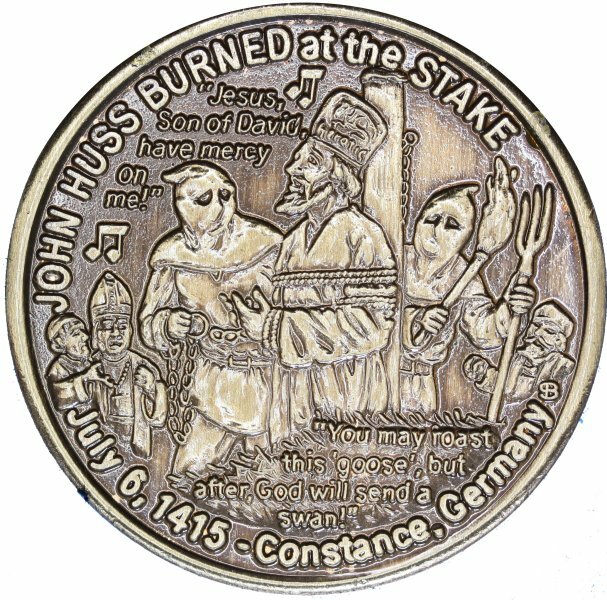 John Hus was a reformer 100 years before Luther. 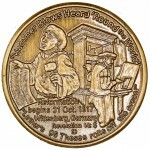 He advocated services in the language of the people and offered Holy Communion with both bread and wine. 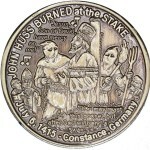 He was burned at the stake in 1415. Unlike Luther he did not have a printing press or a protector like Frederick the Wise. He said, “You may roast this goose (Hus means goose), but later God will send a swan. Many understood Luther to be that swan. Not in Brozatus. Charles V was Emperor of the Holy Roman Empire from 1519-1566. He condemned Luther as an outlaw in the Edict of Worms in 1521, following Luther’s refusal to disavow his own writings. 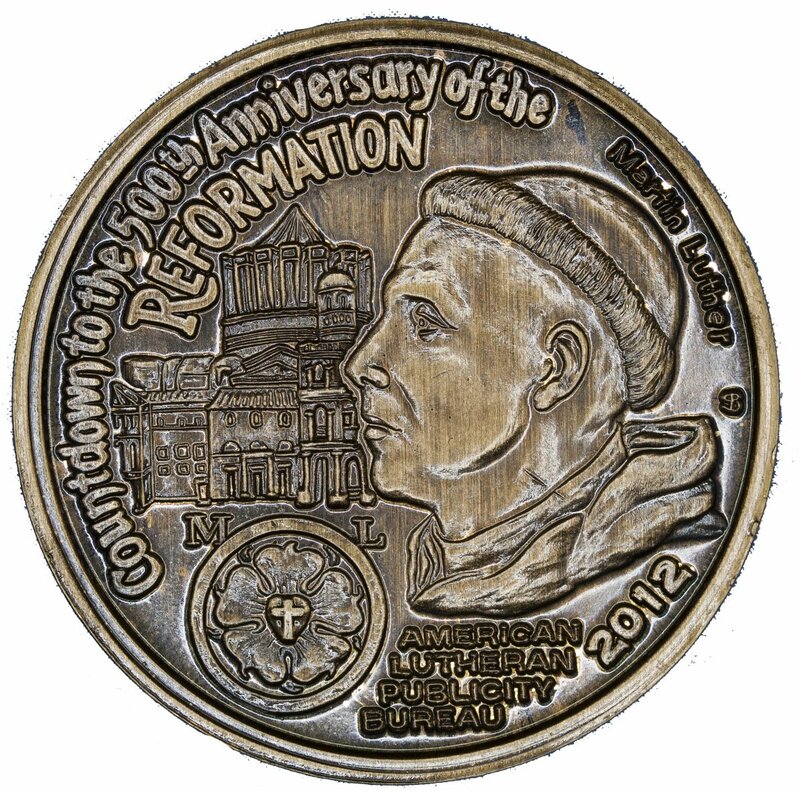 The Augsburg Confession was presented to him in 1530. 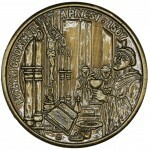 He permitted the passage of the Religious Peace of Augsburg in 1555. 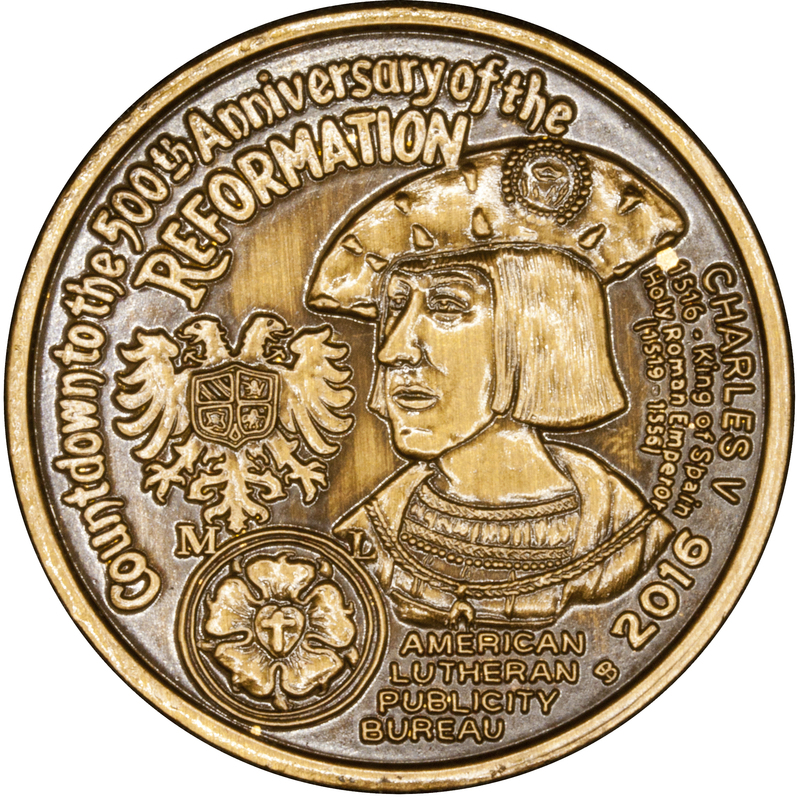 The imperial emblem of Charles appears above Luther’s coat of arms on the left side of the obverse. The scene on the reverse shows Charles V visiting the grave of Luther and refusing to desecrate it, saying: “My war is with the living and not the dead.” The historicity of this event is questioned by some. 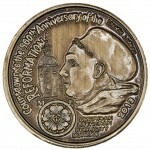 Martin Luther publishes his 95 Theses against indulgences on October 31,1517. 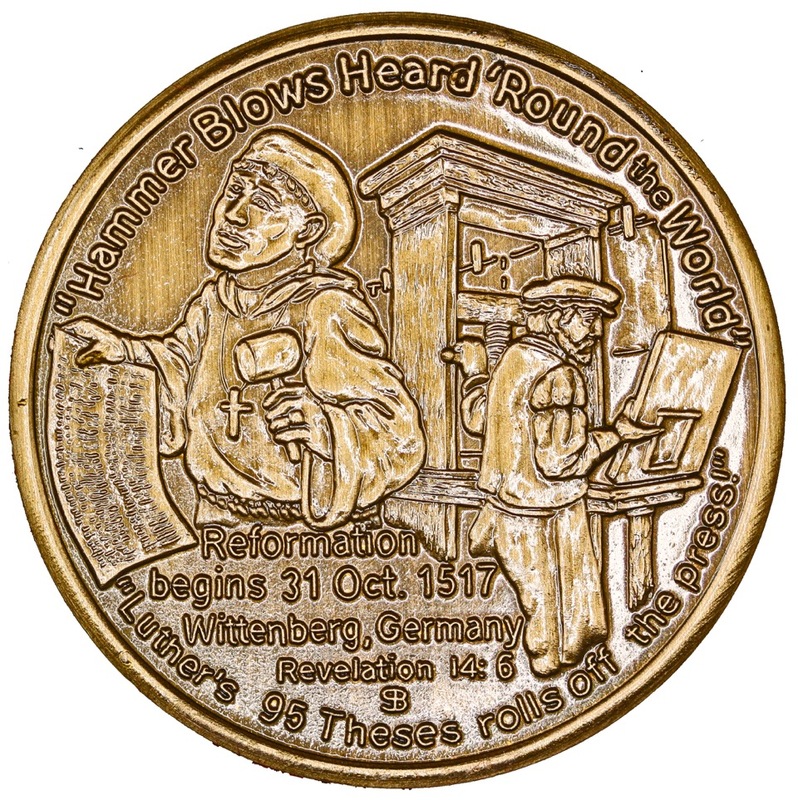 Posted on the door of the Castle Church, inviting a discussion in the Wittenberg faculty, they were soon distributed far and wide thanks to the invention of moveable type by Gutenberg. 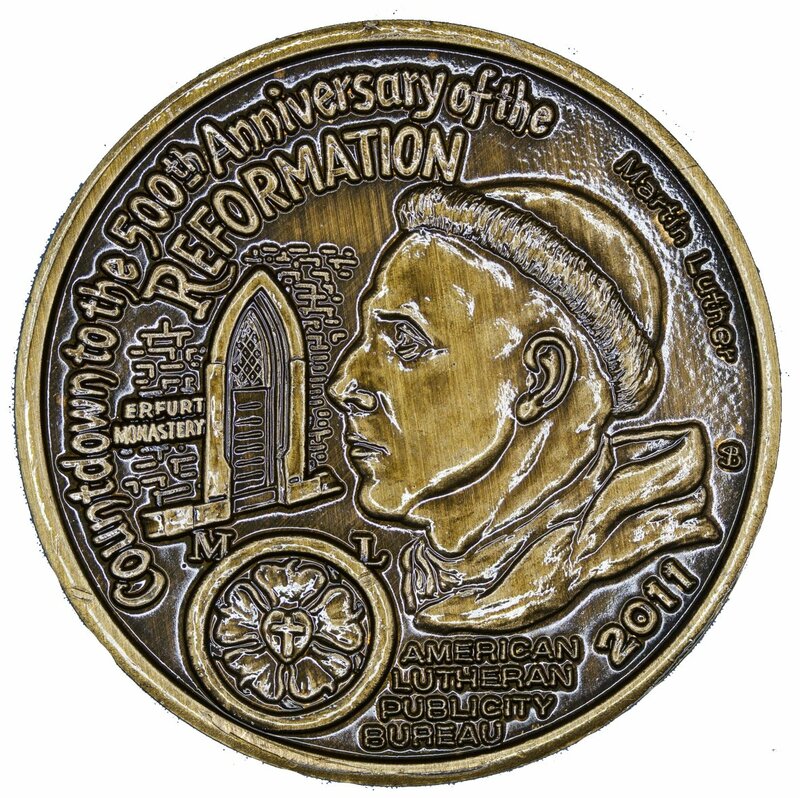 The Lutheran Reformation is dated from this event. 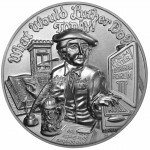 Obverse: What would Luther do? Today! Ancient printing press and modern computer on which is inscribed Forum Letter and Lutheran Forum. In front of Luther a plaque: Sola scriptura; sola gratia; sola fide.